Rocky Hill is a San Antonio Boy! Rocky is the Director and owner of Jazz, Blues and Diamonds. After retiring from Aviation he went back to his love and passion of his roots as a professional musician. Rocky plays Piano, Tenor sax, and belts out some great tunes. He has toured Europe and the USA with show groups and backed artists such as Ray Charles, BB King, Ray Peterson, and Doug Salm..
His road tours included Las Vegas, Hollywood and New York, Texas and California and Virginia. Also, Rocky was the tenor sax player on a National TV show during the 60’s called the Shindig. Rocky received credits for being The Music Director at Virginia Tech University, for the play ”The Colored Museum” a Broadway satire musical based on African American History. This group of people consist of love, loyalty, hard work, friendship and the best front line of professionals around! We are blessed to have the talent you will see on stage. Enjoy ! At the age of 17 Gary Garcia started in the Entertainment Business as a professional backup dancer for Latin Pop/Tejano Artist Amber Rose. Choreography, was Gary's first passion. His energetic moves on stage and on the dance floor will make you want to get up off your seat and boogie on down with him. The Amber Rose group toured, and entertained for a few years nation wide. They opened for Comedian Paul Rodriguez's "Cheese N Macaroni Comedy Tour". Gary also appeared performing in Telemundo's "Maria Conchita Alonso Show" in Hollywood, California in 1998. Also, Gary was discovered by a television producer Sam Riddle. Mr. Riddle's idea was to gather up four talented young men who could sing and dance and created this "Boy Band" which was very popular in the 90's. This is when Gary's singing career started. This tour gave him the opportunity to appear in the Travel Channel's talent show "Destination Stardom" in Honolulu, Hawaii in 1999. WOW! Born and raised in New Orleans, Miriam started singing at the age of twelve. Performed with various groups and bands. The most impressive of them would be the late Dave Brubeck. Her father was a Babtist preacher so her roots are related to Gospel in her early years. Studied voice at South Eastern University and Sanford University. She trained in classical but made the transition to Jazz in the late 1980s. Miriam is a very strong vocalist with tons of personality and a joy to work with. Miriam’s influences are Julie London, Diana Krall, Etta James and the Carpenters. She also hits the blues hard and heavy. Actually she can perform just about anything but preference is with Jazz and Blues. Mr. Mike Brumbaugh hails from the Midwest. Mike has played Trombone for the last 48 years! He is one of the best front line Trombone guys around and is respected by all. Mike has performed on stage with Greats such as Ben Vereen, Tonight show, Johnny Mathis, The 4 Tops, and Andy Williams just to name a few ~~~ Wow! Also, Mike has been with Jazz Blues and Diamonds for the last four years! When Mike is not performing on Stage he is passing on his gift to students as a full time Trombone Teacher for the last 15 years. Mike has a great sense of humor, singer/scatter and is loved by the group! A San Antonio native, who began playing at fifteen, Mike has built a reputation as a solid player who can easily switch from jazz to rock to blues and country with great flair. His positive professional manner has made him an asset to many different musical endeavors. He has played with Etta James, The Coasters, Augie Myers, as well as at Fiesta Texas, and NIOSA, happy hours at the Hilton (Riverwalk), as well as fronting his own band. A member of the American Federation of Musicians Local #23, he is a consummate guitarist with a fun loving style that all enjoy. Mr. Fabulous (The Duke of Cool) aptly describe Mike and his expressive demeanor. Also, Mike is loved by Jazz, Blues and Diamonds and Skeedaddy and Rocky go way back . Don’t forget his awesome Oldies & Rock- n- Roll Vocals !! Steve “T-bone” Bland has drummed since the age of ten. He has played behind the S.A. Blue Cats, Blue Bucks, the Mo-Dels, and The Oh So Good Band. Blue Steel, the Jim Cullum Jazz Band, and artists Frenchie Burke, Chris Holzhaus, Ruben V, Jimmy Spacek, Butch Morgan and Mr. Manny Moore. With quick quips and smooth licks he entertains audiences and musicians as well. 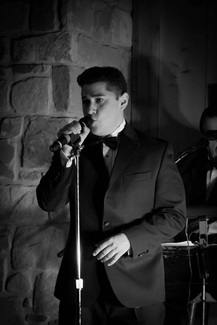 Steve has performed with Jazz Blues and Diamonds for a few years now! “T-bone” has a wonderful sense of humor. Also, this guy adds dynamics like no other drummer around! Mr. Stan Wayne: Hails from Philadelphia , PA. One the greatest music cities in the U.S.A. Stan prides himself as “I’m an Entertainer” and has been for the last 35 years! He has produced and directed a lot of shows for himself and others! Stan is well known for his wonderful vocals & dress impersonations of entertainers like Tom Jones, Frank Sinatra and Elvis! Stan has worked all over the U.S. and performed with the Platters. He has shared the stage with countless well known people like Percy Sledge, The Go’s Go’s, Al Green and the Supremes! Wow! Also, Stan continues to perform with Jazz Blues and Diamonds for most of the groups bigger shows! Our group is comprised of additional brass, vocalist and back up vocalist. They are in our extended network and used in addition to our mainstay members to expand the format required to support customer request for a particular event.